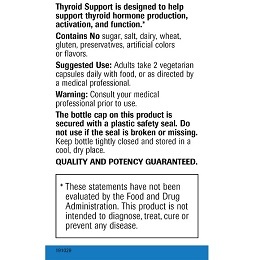 Thyroid Support was developed to improve your thyroid's health and function. One stand out point I would like to note: your customer service was outstanding! Via telephone and email they were ultimately the deciding factor in choosing your company! You have a new client and I will refer you to colleagues! L-Tyrosine is critical when it comes to thyroid hormones because it helps produce the hormones that affect mood, energy levels and stress response. 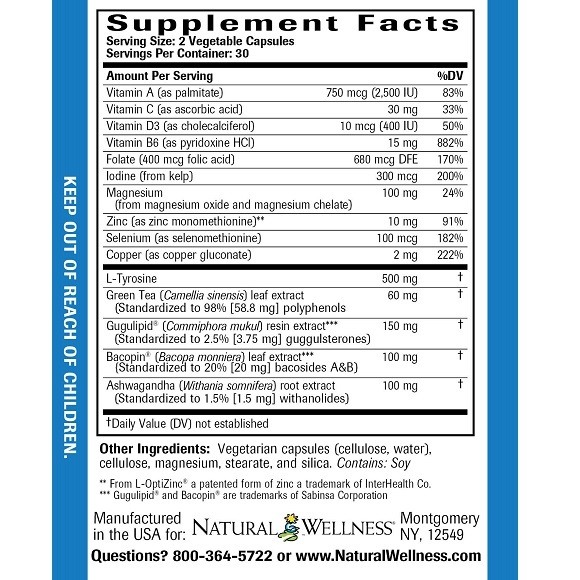 Vitamins B6 and C are key for the natural production and intake of L-Tyrosine. Iodine is not produced by the body but is needed for the production of thyroid hormones. The hormones produced by iodine are necessary for almost every metabolic function in the body. Iodine from kelp is a great source of iodine and is easily absorbed by the body. Vitamins A and D enable the thyroid hormone to bind with specific receptors, supporting energy production and nutrient absorption. Vitamin D is also used by the pituitary gland, which regulates the thyroid. Zinc maintains the structure of these receptors, allowing the thyroid hormone to effectively bind and function. 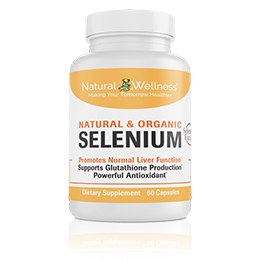 Selenium, an essential amino acid, is used to convert the inactive thyroid hormone T4 (thyroxine) into the active thyroid hormone T3 (triiodothyronine). Folic Acid and Vitamin B help to rid the body of excess homocysteine. Homocysteine negatively affects thyroid function. If homocysteine levels are too high the result is an under active thyroid. Magnesium is needed for thyroid hormones to regulate energy production and mitochondrial function. Green tea provides EGCG which increases the amount of calories used by the body resulting in a faster working thyroid. Gugulipid is an herb that helps to stimulate the thyroid as well as allowing for easier absorption of iodine. Bacopa monnieri is another herb that supports the production of thyroid hormones, while at the same time boosting mood, relieving stress, and making it easier to concentrate. Ashwagandha is an herb that helps the body better respond to stress. Stress is a critical factor that negatively impacts normal, healthy thyroid function. 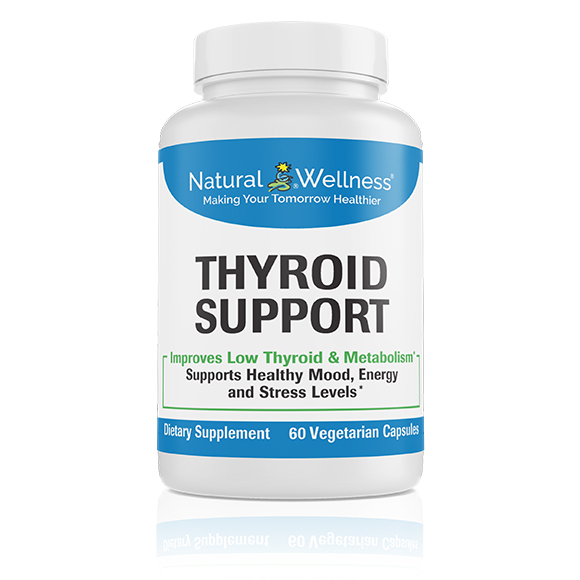 Thyroid Support from Natural Wellness ensures that your thyroid is working optimally, so you have the energy you need! The thyroid gland is butterfly-shaped and lies across the trachea at the base of the throat. It is one of the largest hormone-secreting glands in the body. It produces and releases two different thyroid hormones, mostly T4 (inactive) and small amounts of T3 (active). Both of these can influence every cell and organ in your body. When you have too little of these hormones, it slows down your thyroid function. When needed, T4 is typically converted in the liver, kidney and other tissue to active T3. The main action of the thyroid hormone is to speed up the body’s metabolism. These hormones are also vital to the development and normal growth of children. They interact with other hormones to regulate carbohydrate, fat and protein metabolism, and control other important biological functions. 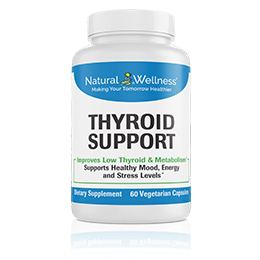 Thyroid Support was developed to keep your thyroid healthy and functioning properly. 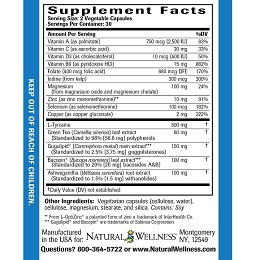 Take 2 vegetarian capsules daily with meals, or as directed by a health care professional. One 60 capsule bottle should last 30 days. 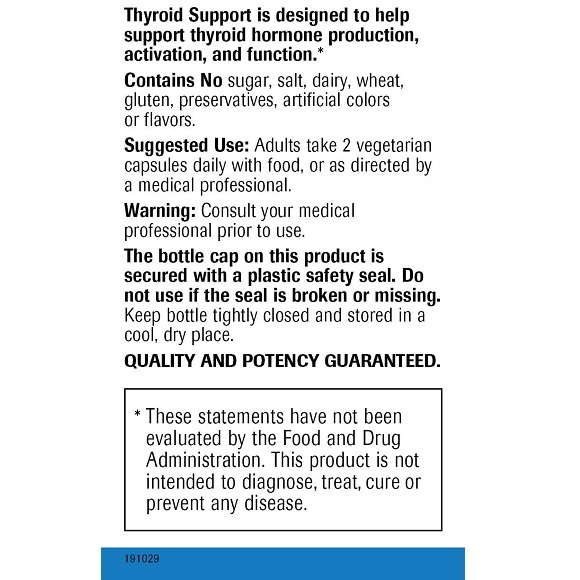 Thyroid Support is MANUFACTURED in the USA to meet FDA strict current Good Manufacturing Practice regulations (cGMP).